On opening the pot I was initially surprised for some reason that I could predominately smell tuna, which sounds kind of dumb, but as I've tried so many ginger flavoured beverages in the past that I've lost count, I expect ginger to burn my nostril hair as soon as I open anything with ginger in it. I dumped most of the contents of the pot on my open sandwich, but saved a little to taste. I was right the second time where I had surmised that the soy would calm the ginger ingredient. 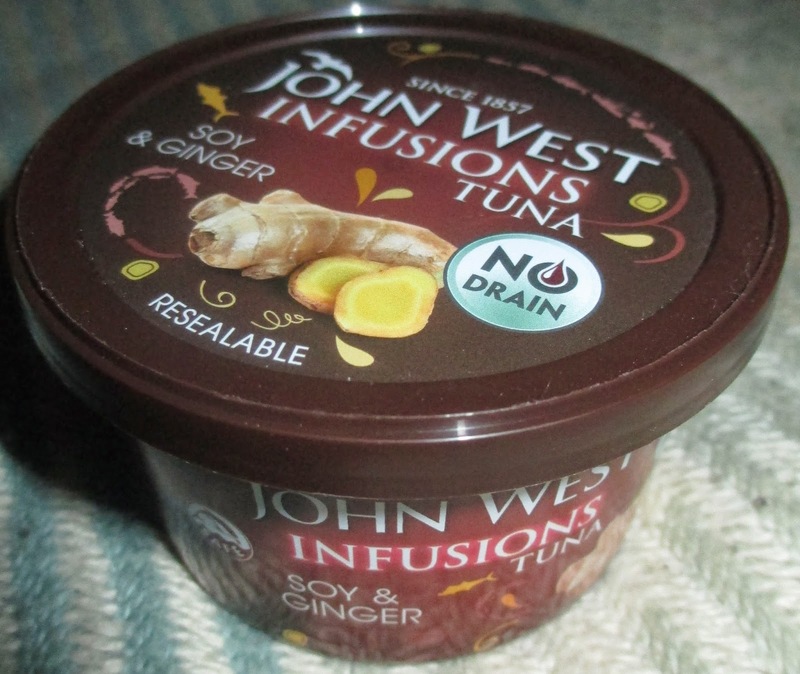 There was an initial flavour of tuna which then seemed to do a little jig with the soy and then the ginger tried to cut into the dance. The tuna seemed to disagree with the pairing and told both the soy and the ginger to leave the dance floor, leaving the tuna as Billy No-Mates to do a John Travolta in the aftertaste. A subtle blend of flavours making a light and breezy Summery feeling sandwich. Nice one John West! 80g pot per 100g has 204 calories with 0.6g of sugar and 10.9g of fat. Ingredients included; Skipjack Tuna (80%), extra virgin olive oil (10%), rehydrated soy sauce (7%) (water, soybean, wheat, maltodextrin, and salt), ginger, and natural ginger flavouring.